What if your favorite cereal company had more in mind than just making sure you got a tasty breakfast? Scott (short for, well, you don’t want to know what), who gets migraines and sometimes sees things, sees a rabbit-headed man on the way to school, and finds a leprechaun in a public bathroom. Emily and Enzo (twins who look so little alike that it’s suspicious), who have an incredibly tall, big-footed housekeeper, think that their foster father is acting weird. What do the kids have in common? Their parents work for the Goodco Cereal Factory, a company with ties to nearly everything in town. Is there maybe something a little funny about Goodco? Is there REALLY “a little bit of magic in every box”? Rex’s new fantasy is hilarious (a delight in a genre that is too often filled with portentious prophecies, grim weather and unsmiling heroes) and engaging. In spite of its (appropriately) epic length, the story moves quickly, and no reader will be tempted to put the book down. The characters, both the realistic and fantastical, are wonderfully drawn, and the back-story incorporates traditional myths and legends in a refreshingly original way. While Scott, Emily and Enzo’s adventures are not over at the end of the book–a sequel! Hooray!–the volume is wrapped up in a very satisfying manner. In spite of that, I still can’t wait for the next book. This month, Kelly tells us about Stress Less: Your Guide to Managing Stress by Heather E. Schwartz, a helpful book for anyone nearing the end of the school year. It’s not often that the combination of picture book and haiku get “mashed-up.” Andrew Clements used a series of haikus to tell his story, Dogku but as endearing as the book is, those were more a series of poems fit to describe the dog and his family. In Won Ton, Wardlaw is able to tell the story using only haiku and it doesn’t seem stilted or strained—not that Clements’ did, it was wonderful, too. There’s nothing revolutionary about the story. Won Ton, a cat, finds himself in an animal shelter, is finally adopted by a family, reluctantly settles in and becomes the “ruler of the roost.” Don’t get me wrong, he is a cat of great personality and definite opinions. He’s very “cat-like” and engaging. It’s the haiku though, that makes the whole thing work. The short, precise form fits perfectly with the cat’s “thoughts” and actions. It will also appeal to those youngsters who need shorter but fulfilling texts. 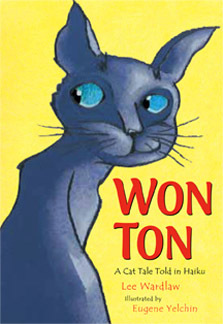 All in all, just like the boy in the book, you’ll be beguiled by Won Ton, a new friend you’ll want to visit over and over again. Monica Wellington’s books are perfect for the young preschool crowd. Right now, her book Mr. Cookie Baker is a favorite in our house, especially when I make cookies to go along with it. The story is a simple one. Mr. Cookie Baker takes readers through the steps of cookie baking and sales. After a busy day at his shop, Mr. Cookie Baker is able to enjoy one of his tasty creations. You can recreate the fun of this story with the cookie recipes included in the book. A yummy treat! 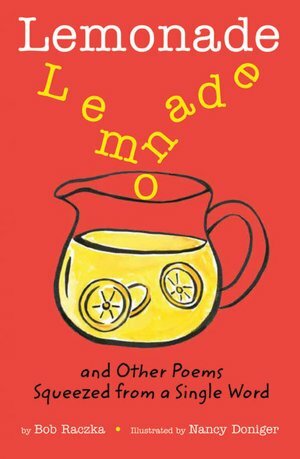 Lemonade and Other Poems Squeezed from a Single Word is a delightful collection of poems sure to be engaging for a wide range of kids and adults. Inspired by the concrete poet Andrew Russ, Bob Raczka set out to make poems using only the letters from one single word, which is also the title of the poem. The poems are visual in that each letter of the poem is lined up vertically with the corresponding letter from the title word. This makes reading the poems a little bit like solving a puzzle. The poems are also typed in conventional verse on the next page. Aside from those “aha!” moments when you understand the poems, the best part of this collection is the likelihood that readers will be inspired to make their own “single word” poems. Summer break is upon us and for those of us in the Chicago suburbs that often means trips into the City to enjoy all it has to offer. Michael Mullins offers the perfect primer for preschool and young school aged children to read before your adventure begins. The picture book tells the story of a boy named Pete and his family taking a trip to Chicago, complete with their dog, Larry. This is not the family’s first trip nor is it Larry’s first time getting lost on vacation. Other books in this series feature Larry getting lost in Los Angeles, Texas and Seattle. This book covers all of the main attractions in Chicago including “The Bean” which is prominently featured on the cover. Larry and his family also experience a boat tour on the Chicago River, Navy Pier, Wrigley Field and of course, Larry getting to taste both a Chicago-style hot dog and Chicago-style pizza. In fact, Larry is separated from his family by the smell of one of our world famous hot dogs. The book takes Larry on a journey through Chicago as he looks for his family, and is continually distracted from his goal by Chicago’s many attractions. This is a first-rate lost and found journey. The book also offers stunningly bright retro-cartoon style illustrations, often from the perspective of Larry the dog that will appeal to all preschoolers. Larry himself is particularly engaging with his round face and big, pink nose. The factual information about the City of Chicago is written at the right level to pique the interest of a preschooler or kindergartner. In addition to being an excellent choice for local children, this book would be great to have in your home for out of town visitors coming to stay during the summer months and planning on taking in the sites of Chicago. Today, in preparation for summer free-time, Eileen shares The Junior Jetsetters Guide to Chicago by Pedro F. Marcelino.